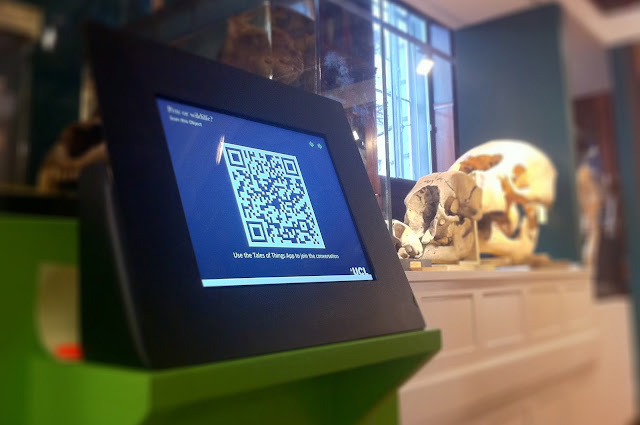 UCL’s Grant Museum of Zoology is reopening on 15 March, allowing some of the rarest extinct animal specimens in the world to be displayed for the first time, but in contrast to the more traditional museum outlook, the new Grant has integrated iPads, QRCodes and twitter into the mix via a project known as QRator. QRator is an iPad-based system that allows everyone to be a curator and share their views on an exhibition. Visitors can examine an object before leaving their thoughts about it on an iPad to create a digital, ‘living’ label that subsequent visitors can read and respond to. By downloading a free application to an iPhone or android phone, visitors will be able to see rolling updates to the digital label after they leave the museum, or via twitter. We are horribly biased on this but we think the mix of iPads/QRCodes and Twitter represents a new step in models for interaction in museums. The iPads pull in unique twitter tags from the outside world, allowing the museum objects to be followed and conversations to take place beyond the museums walls.